ur mission is to support spiritual growth among men, helping men to mature as disciples as they encourage spiritual formation in others. Please contact UMM President Richard Reeves at rgreeves@sbcglobal.net for more information. Six times a year, the UMM meets at 8 a.m. in Fellowship Hall for a time of fellowship, fun, inspiration, and a hearty breakfast with friends and family. Everyone is welcome, and childcare is available on request. The UMM sponsors a yearly golf tournament, open to all, and trophies are awarded. It’s lots of fun, whether you are a participant or a spectator. Our UMM group is the official sponsor of Cub Scout Pack #505 and Boy Scout Troop #505. Click here to see Troop #505’s website. 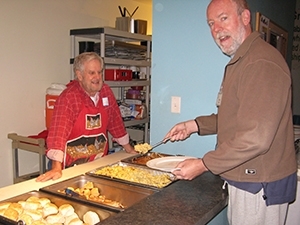 Each year the UMM sponsors a retreat, usually in January, open to all men, whether members of the UMM or not, at a nearby retreat center in the country. The event begins on Friday evening with a hearty meal and ends shortly after lunch on Saturday. Over the years, programs have varied from featuring noted speakers to talks given by our own members about applying their Christian faith to their daily lives, in their marriages, on the job, as fathers, etc. This more relaxed setting gives participants the opportunity to unwind and share more deeply their own inner faith struggles. The retreat concludes with a communion service led by the pastor.